Two million years ago someone picked up a stick and hit their neighbor and the club was born. You can not underestimate how important a development this is in the history of military science. In one fell swoop our ancestor doubled his effective reach and power and greatly reduced the likelihood of being hurt while delivering the blow. Imagine this “Einstien’s” surprise when his other neighbor picked up a longer stick, sharpened one end against a stone and stuck our “Einstein” in the gut. Thus started the arms race that continues to this day. In the world of the Fantasy Role Playing Game the “pointy stick” usually comes in a number of varieties. The smallest varieties are arrows and bolts that serve as ammunition for bows and crossbows. We are not going to focus on them. Instead our interest is going to be in the larger hand held varieties; the javelin, the spear, the pike and a very specialized version of the javelin known as the Roman pilum. While swords tend to get all the glamour and attention, the true workhorse of the medieval and ancient battlefields was the spear. The reasons for this are as simple as they are obvious. The skill required to create a spear is less than that required to create a sword. 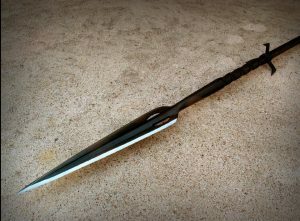 A rudimentary spear can be created with nothing more than a long straight shaft with a small blade attached. The pointy end probably started as one end simply sharpened to a point and evolved with the point being hardened by heat, to having a flint blade lashed to it, to having a forged blade attached. The raw materials for a spear are much cheaper than that of a sword. In a world were wooden shafts literally grow on trees, the true cost of the weapon is in the metal. With same raw metal and time used a master smith would use to make a sword, an journeyman smith could create at least four spears. If you are outfitting an army numbers like this matter. What also matters is the spear is also much more versatile a weapon. Unlike the sword it is conducive to use by poorly trained conscripts in tight formations. It is equally at home used one handed with a shield, two handed, or thrown. The bladed end was designed to pierce but was equally effective as a slashing weapon. Your typical spear will be five to six feet in length while shorter races will typically use spears four to five feet in length. Assume the length of a spear created by a given race will about the same as the height of that race. Lances and Pike are essentially longer versions of the spear with ends specialized for piercing. Lances are ten to fifteen feet and specialized for use on horse back, while pikes are twelve to eighteen feet and are meant to be used by tight formations of footmen. Note, pikes should share the same penalty for attacking targets within five feet that lances do. Both can be used one handed under certain circumstances. Lances can be used one handed while mounted. Pikes can be used one handed in formations where they part of their weight is supported by the shoulders or shield of the rank in front of them. Neither are made to be thrown but might be by creatures of Large size or larger. Not raw but using a Roman Pilum would be interesting… Designed to be thrown either injuring the target or rending his shield useless. The upper part of the shaft was designed to bend and get caught in the shield. 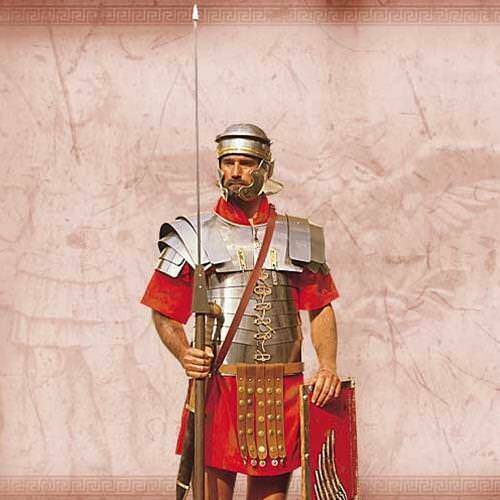 While spears are javelins are thrown weapons and are recoverable (either by your enemy or by you after combat), Pilum are treated as ammunition and are not immediately reusable. When a Pilum strikes and damages a target it is embedded in the target. Until it is removed the target’s movement is reduced by 5′ a round, any attacks or skill checks are made at disadvantage, and the Pilum will do 1hp damage per turn if the target does anything other than walking and supporting the Pilum. Removing the Pilum does 1d4 damage. If removed by a someone proficient in healing it subtract 1 from the roll. If a difficult healing check is made, subtract 2 from the roll (0 minimum). If attack misses by less than the any (non magic) bonus provided by a shield then the Pilum has impaled the shield and rendered it useless until it is removed. Removing a Pilum from a Shield takes a full minute and most opponents will drop the affected shield. Magical bonuses reduce the chance of penetration by amount of magical bonus. Note that in 5e a magical shield would not be subject to penetration. 5E Shield: (2-1-0) = 1 Meaning a 15 misses but renders the shield unusable. PF +1 Tower Shield: (4-1-1) = 2 Meaning a 14 or 15 misses but renders the shield unusable. A Pilum works the same if used in melee. A successful attack embeds the Pilum but the attacker retains his grip. 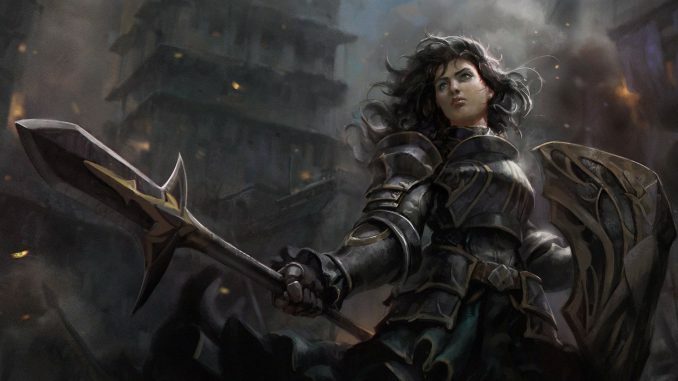 The target has the option forcibly to remove it during his turn or the attacker has the choice to forcibly remove it during his next turn or drop it. If the attacker forcibly removes it counts as an automatic hit and the attacker add his strength bonus to the damage. In any event once removed the Pilum is only suitable for use as an improvised weapon doing 1d4 damage.